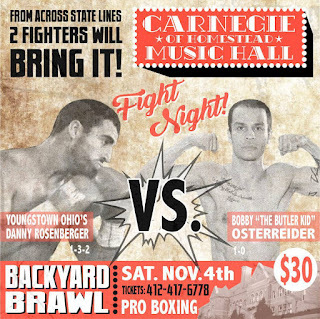 Sometimes a fighters record is nowhere near an indication of what a boxer can bring to the table , as is the case with Youngstown's Danny Rosenberger. Rosenberger will clash with Bobby Osterrieder of Butler, Pennsylvania in a four-round bout at the 152-pound weight limit in a match being billed as a backyard brawl on the Integrity Fighter Managment promoted card at the Carnegie Music Hall of Homestead located right outside of Pittsburgh this upcoming Saturday, November 4th. Rosenberger, 27, who trains under the direction of Tom Cordell at Downtown Boxing Club currently sports a deceiving 1-3-2 record while taking on solid competition which has a current combined record of 34-8-2. "The fighters I've been in with should give me an advantage in the ring. I know I had a few losses but in this game, you can't give up." Rosenberger said of the stiff competition he's faced so far in his career. On the flip side, Osterrieder is only 1-0 having won his debut in his hometown of back in May. Osterrieder, 28, stated "my mind was very clear and I had no distractions for my debut. I really worked hard to make sure I would have a great fight and come out with the win. For my second fight, I feel just as confident and focused as the first one. I believe that fights are won or lost in the gym. The confidence is the side effect of hard work and preparation leading up to the fight." when asked about the difference in mindset between the first and second fight. Training at Butler Cubs under trainer Billy Wolfe, Osterrieder is working hard to make sure there is no sophomore slump heading into this bout. "My training routine is always satisfying. Plenty of road work and sprints. In the morning I have my first workout where I do cardio and strength conditioning. In the evenings we box. Mitts, heavy bag, and plenty of sparring. We also watched some tape of my opponent so we do work on specific things that will work well against his style. I can't wait for November 4th to be here, I'm ready to go and show everyone who I am and what I am capable of as a fighter" said Osterrieder about his training. Rosenberger is also working hard in his preparation for this upcoming Saturday. "After my workout with Tommy, I meet Zack Page at planet fitness for cardio and other types of conditioning workouts," Rosenberger said of his preparations. Osterrieder also contributes some rounds in August with Youngstown prospect Alejandro "Popo" Salinas in helping give him a boost in preparations. "Working with him meant that I had to make sure I'm using everything I've been working on in the gym. Using my jab and footwork. Making sure I kept moving my head because getting hit by Popo is no fun" said of his sparring work with Salinas. Like Osterrieder, Rosenberger also got some sparring in with a known Youngstown fighter in Darnell Boone. Even with the help of Boone, the only fighter to defeat the current WBC light heavyweight champion Adonis Stevenson, he knows it's never easy taking on an opponent so close in their home territory. "Fighting in this guys backyard I’m going to have to either stop him early or make the fight so one-sided the judges won’t be able to give me a bad decision which I've experienced in the past," said Rosenberger. Headlining the exciting 9-bout card is undefeated Pittsburgh native Gerald "G5" Sherrell (7-0, 3 KO's). Sherrell, 24, will take on Shakeem Hodge of Reading, Pennsylvania in a 6-round middleweight match. Hodge, 26, who last fought in July is currently 5-0 with 4 wins coming by of knockout. Tickets for the event, which starts at 7:00PM with the doors opening at 6:00PM, start at $30 and can be purchased by calling 412-728-3409.